Dr. Tapas Kr. 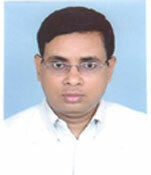 Bhattacharya, Assistant Professor, had his B.Sc. (H), B.Tech & M.Tech. from Calcutta University & PhD from Jadavpur University. He has been teaching Whitewares, Ceramic Raw Materials, Chemical Thermodynamics & Kinetics. His present research work is on Whitewares product from cheaper waste materials like Fly Ash & Slag, Synthetic Ceramic Raw Materials and he has a number of Publications on his credit.